Two leaders in the Canadian fresh herb, organics and specialty produce arena team up to provide one national source for retail and food service clients – Green Thyme Herbs Ltd.
Evergreen Herbs Ltd. of Surrey B.C and Jaycee Herb Traders of Guelph, Ontario are pleased to announce their strategic partnership under the new banner Green Thyme Herbs Ltd.
Large and small national retailers as well as food service companies will now be able to conveniently single source their fresh products no matter where they are located in Canada. Locally grown and sourced worldwide, the herb and produce specialists have been providing premium fresh herbs, microgreens, specialty vegetables, exotic fruits and gourmet edibles, as well as certified organic herbs and produce for over 20 years. Both companies will now be able to offer their retail and food service clients the same fresh products, year ‘round in standard and custom packaging, as well as private label. In response to growing demand, Evergreen began its nationally recognized certified organic division “Roots Organic Inc.’ in 2004 and now offers over 120 certified organic products. Jaycee Herbs complements the organic product line in Central and Eastern Canada. “Both companies have known each other for a long time, and it made sense to bring the East and West together, to extend our delivery services of branded fresh herbs, organics and specialty produce,” says Wolfgang Breisser, Vice President of Jaycee Herbs. Green Thyme Herbs’ sophisticated logistics system includes the use of air freight as well as company owned trucks, enabling them to provide 24-hour turnaround from order to delivery. Green Thyme Herbs will officially begin collaboration on November 1st with an integrated order and logistics system. Customers can expect the same personalized service during the Green Thyme start-up phase. Evergreen Herbs was started in 1996 in Surrey, BC by two brothers who wanted to help their father expand his farming. They switched from growing traditional crops like potatoes and onions to basil, mint and kale. Working from their Dad’s garage they packaged and sold the new produce. After attending a Canadian Produce Marketers Association conference in Calgary the business grew significantly, from 40 to 140 acres. Now thousands of pounds of herbs and certified organic produce are grown annually to meet the demand. Today, the company offers a wide range of fresh specialty herbs, edible flowers, specialty vegetables, microgreens and a lot more. Evergreen Herbs are strong supporters of local Quest Food Exchange, reducing food waste and giving back to their community. Jaycee Herbs was founded in 1995 in Guelph, in southwestern Ontario, in the heart of fertile farmland near the University of Guelph agricultural college. A small family-owned business they grew quickly, providing fresh herbs to large retail chains across Central and Eastern Canada. 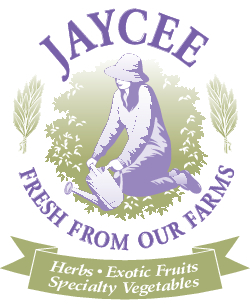 Jaycee Herbs soon moved to a larger facility allowing the introduction of baby vegetables and exotic fruits. Expanding into the United States in 2004, Jaycee Herbs’ distribution centres in both Guelph and Atlanta, Georgia are the hubs for delivery to food service and wholesale houses in North America. Even with their success, Jaycee Herbs continues to be a customer-friendly focused family business capable of developing custom solutions within short lead-times.